Relish the pancake delight with flavored applesauce and some almond and berry topping. These fluffy saucy pancakes are worth to consume for breakfast as they are easy to mix, taste yummy and enhances a sweet touch, almost sufficient for a person to feel full. 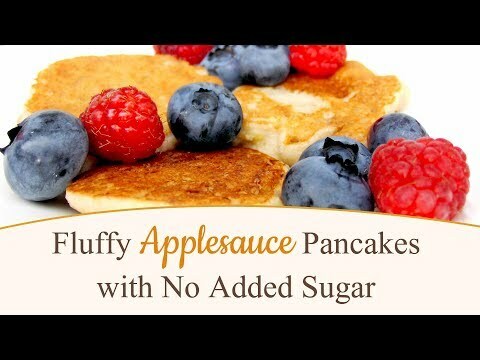 The Applesauce Pancakes gives a complete pleasure to your taste buds with no sugar in it and with a nutty flavor touch and a mixture of fitness and sweetness together. These pancakes will absolutely be your favorite on the list every morning! It takes around 30 minutes to prepare this enticing delicacy. In a bowl, mix the applesauce, almond flour, coconut flour, eggs, coconut milk, nutmeg, stevia, and salt. Mix them with a fork or in the beater; mix them well in order to eliminate all the crumbs. Heat a stainless steel pan over medium-low heat with 1 tablespoon of coconut oil. When the pan is heated, pour ¼ of the mixture onto the pan and spread it over the pan if needed. Flip the pancake once bubbles start showing up, and cook it for two or three minutes more. Add more coconut oil to the pan if needed, and repeat the process 3 times more. We Being Fit highly recommends these pancakes in your breakfast, as it is light, suitable in the morning, very hearty and filled full. Applesauce simple adds a moist texture. The recipe is gluten-free, high in proteins and can be in your favorite morning meal list.